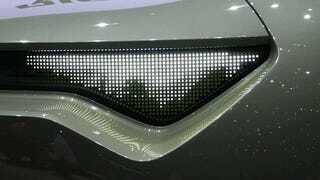 In a nod to us internet hipsters, Kia’s new concept has animated LED panels for headlights. Don’t know how suitable they are for lighting up a nocturnal road but they’re very kooky and very Korean. I tried to get all frames but the car was on a rotating platform and they didn’t let anyone on it, not even my tripod. Even after I described the basics and the magic of animated gifs to all Kia personnel around. 감사합니다, guys!